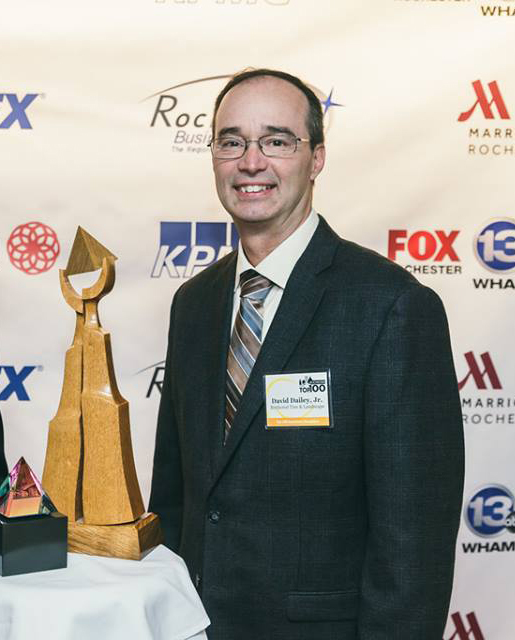 Birchcrest Tree & Landscape is ranked 15th on Rochester’s list of Top 100 fastest growing privately owned companies. For that, we thank each of you who put your trust in the 95 professionals who are part of the Birchcrest family. We also thank Rochester Business Alliance and KPMG, LLP for sponsoring this program. To be eligible for this honor, a company must have earned at least $1 million in revenue in each of the three most recent fiscal years. I started this full service tree care, landscaping and lawn care company in 1981. While we enjoyed steady growth from the start, we have enjoyed even greater growth in the last 10 years. This growth culminated in our being eligible for the Top 100 listing this year. I attribute the company’s success to the dedication, education and creativity of our staff. Birchcrest employs 10 ISA Certified Arborists, two ISA Board Certified Master Arborists and eight NYSNLA Certified Nursery & Landscape Professionals. I personally thank you for your business, and look forward to serving even more of you in 2015.